The Foscarini Twiggy floor lamp - The natural, linear aspect fuses perfectly with the four different chromatic colour finishes: yellow, red, white, black, & new additions greige (mix of grey and beige), crimson (less vibrant than the red) and indigo. 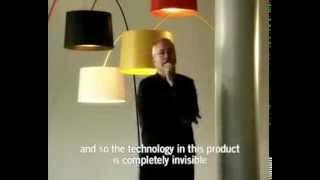 The shape of the Foscarini Twiggy floor lamp diffuser allows full exploitation of the three light sources that offer both direct light emission, and reflective light through the transparency of the upper disc. Adjustable height due to counterweight system 195cm to 215cm. Dimmer fitted. An additional stem set is available for the Foscarini Twiggy Floor to expand the length of the arching arm (please contact the office for further information). Please see the line drawing (left) for more information; the left drawing shows the Twiggy light with two additional stem sets, the middle drawing shows the Twiggy light with one additional stem set.